From the archives. This was originally posted on the 27th September 2011. Shortly after this, I changed to a HP/Palm Pre3, which I am still using. I like reviewing things. I find I can talk for hours about how that circular thing rotates along a 270 degree plane, only to return to its initial position with a satisfying spring loaded action. Not too much spring, just enough to give a satisfying feel of quality. It’s a stainless steel circular thing by the way. It may sound strange to be reviewing a 4 year old phone, but for reasons that will become apparent, this is the most appropriate way. I don’t understand how “reviewers” can give an honest opinion of a product having only used it for a few days prior to the review. I find that the outcome usually goes along the lines of “I didn’t get the chance to use this to its full potential, but generally I didn’t like it” or “I love it, buy one”. I have used this phone every day for 3 and a half years, 1,213 days to be precise. I believe that is long enough to give an honest opinion, of all features. Before the N95, I was a proud owner of a Samsung E900. Not the fanciest of phones looking back, but still served me well. An unfortunate smelting charging accident left it somewhat limited in use. That left me phone shopping for a day or two. I had been looking at these new-fangled “smartphones” that seemed to be gaining a reputation at the time. Touch screens had not yet made a big break into the phone world and built in WiFi was something still limited to only the most up-market phones and PDA’s. When phone buying, I look for something that will last. I don’t mind putting in a comparably large investment if it will last. I don’t tend to follow the crowd (I have a habit of hating most of the popular gadgets), I look for quality and features. So along comes the N95 and the N95 8GB, modestly taking its place at the top of the smartphone market. It certainly didn’t come in cheap, but it packed almost all of the cutting edge features at the time into a form factor that became a landmark icon for Nokia. To this day, I no other phone comes to mind that has a two way slide. 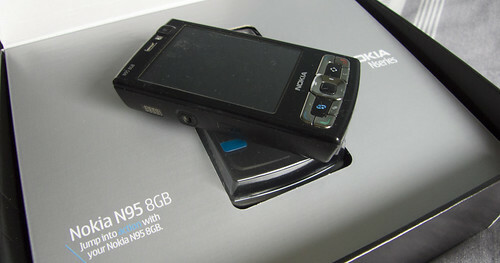 I remember unboxing the N95, which Nokia seems to make an enjoyable experience. I got my N95 from 3 UK, so it came with the usual carrier locks and branded firmware. However, 3 kept all the packaging vanilla. The phone came packaged with a USB cable, mains charger, TV output cable, Driver CD, earphones and documentation. I’m not a believer in reading the Quick Start guides, so I jammed in a SIM card and went for it. The first boot took an age. It wasn’t even a user friendly age, a white screen, no icons, no back light, nothing. I now know that this is normal on first boot, or after a reset – but still – an animated boot splash couldn’t have gone a miss. Initial set up was quick and easy, the usual time / date and language choices. Network APN’s and message gateways where automagically set up for me, so I could start using the phone immediately. It took me a few days to get used to things, notably the different space key placement, one of the finer details of moving from Samsung to Nokia. For its time, the battery life wasn’t great. I was pressed to get 3 days moderate use out of it before having the phone refuse to turn back on. The old E900 was quite frugal on power, regularly turning back on when all the indicators said 0%. Zoom forward over 1000 days, the old faithful is still going strong. Not once have I been disappointed by lack of features compared to modern phones. The camera keeps up with the newer Sony Ericsson CyberShot (I’ve compared with the K850i, C902 and W995). To be fair, there is a difference. For a quick photo to remember something (which is what phone cameras are for?) the N95 will still hold its own, even against dedicated digital cameras. Start talking about Full-HD recording and bi-directional microphones, then I’m in second place. WiFi has always been reliable for me, Bluetooth has never put a foot wrong. GPS on the other hand has been a nightmare. I have never been able to get it to reliably connect, making the N95 as a navigation device quite useless. Call and audio quality has been fantastic, loud speakers still pack enough power for most scenarios. My biggest observation about this phone after a few years though, the build quality. Yes, it’s a bit battered and bruised on the back – but the slide is still tight, the buttons and keypad still feel sharp and nothing has fallen off or chipped. About 6 months ago, it even got wet, to the point where it decided to switch itself off. 2 hours later, having removed the battery and let it roast on a radiator, it fires back into life no problem. I am disappointed though, it asked me for the time and date! Symbian has continued to be sub-par next to its rivals, Nokia Ovi has been an attempt to change this – but has sadly gained a rather bad reputation. 4 years after release, this phone is showing it’s age. It is for that reason, and that reason alone – I sadly cannot recommend this phone to people any more. It’s a fantastic phone, it has served me well for a very long time, but it’s time to be retired. Well done Nokia, you created a phone that has become a deserving icon for your company.